In the mid-distance is the Pig and Whistle pub with the gantry which was used to hang the pub sign. The gantry still remains today. The pub was originally a general store and newsagent. It became a public house in the 1890s and is now a private residence. 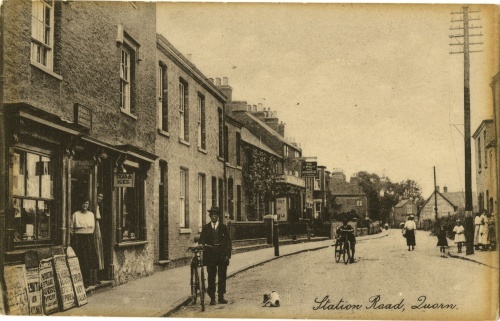 The shop on the left was Gamble's the newsagent, whose name appears on the back of the postcard as the publisher.